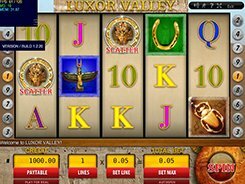 This is a simple 5-reel slot that is equipped with 5 bet lines and is based on an Ancient Egyptian theme. 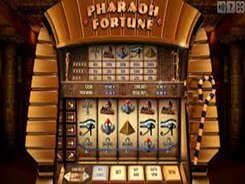 The background of the slot shows off a richly decorated pharaoh’s palace, and the slot machine itself seems to be standing right at the heart of the palace. 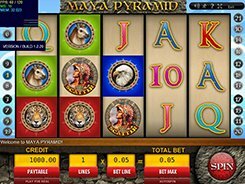 By adjusting a coin value from $0.01 all the way up to $0.05, the number of paylines, and the number of coins (up to 5), you may place a maximum of $1.25 per spin, so the slot is rather focused on low rollers and casual players. All the symbols on the reels fit the theme perfectly and include a pyramid, the Eye of Horus, a scarab, a sphinx and an Egyptian symbol of life, the ankh. A winning combination is created when three or more identical symbols fall on an active payline starting from left to right. The ankh and sphinx are low-paying symbols that award 5 to 100 coins, whereas the scarab and the Eye of Horus will grant you up to 400 coins, for 3–5 matching symbols. Hitting five pyramids is the most desirable combo in the game since it pays out 2000 coins (or $500 on the maximum stake). PLAY FOR REAL MONEY!